Large wooden table with parched earth surface. At one end of the table there is a tightly cropped image of a female figure blowing into a large bottle with the reflection of an industrial bridge. 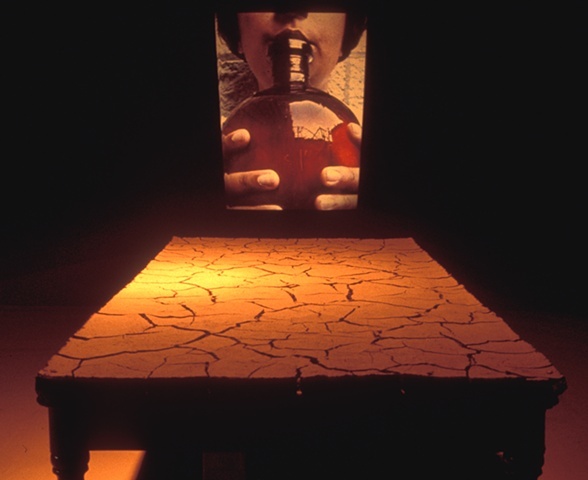 At the other end of the table is a full projection of a male figure standing in a vast field blowing into a large bottle slowly turning and slightly out of sync. Each projection is accompanied with its own audio, which creates a repetitive and haunting echo, which travels around the room.